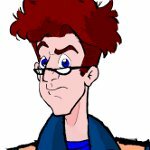 Hello I'm from Argentina, for the year 1997 I started working on a screenplay based on the Ghostbusters for the audiovisual sector for graphic design career. I wrote about more than sixty pages and i submit this script as a prototype, and then because of time between work and other classes of graphic design career, I could not finish it. A month ago almost fifteen years later, I found the script forgotten. My cousin who has not registered here told me he had received information on the date of birth of the characters from the Ghostbusters and he spoken me about that page. I am sincerely grateful to you for the creation of this page I hope to collaborate as much as possible. May I also assume you are a fan of The Fifth Element? my mother called Leeloo because I did not like being told luli. I like the fifth element too, but I'm more a fan of the Ghostbusters that the fifth element. Ah, okay! Leeloo is a cute name!